The duality of the term “subject” (as pronoun and verb) reflects Kallat’s subtle insistence on ambivalence. Lunar Notes—a screen comprised of hundreds of strung marble beads depicting the Taj Mahal—takes on a radically new meaning when inspected up close. The meticulous hand-casting of the beads is revealed by the different names of real and mythological lovers on each individual bead. In lieu of becoming an ode to the greatest Indian monument of love, the screen becomes a more quiet and intimate meditation on the uniqueness and complexity of love, and the light swaying of each string of beads further reinforces notions of fragility and ethereality. Kallat is clearly fascinated by names and their ability to act as surrogates for both national and personal identities. 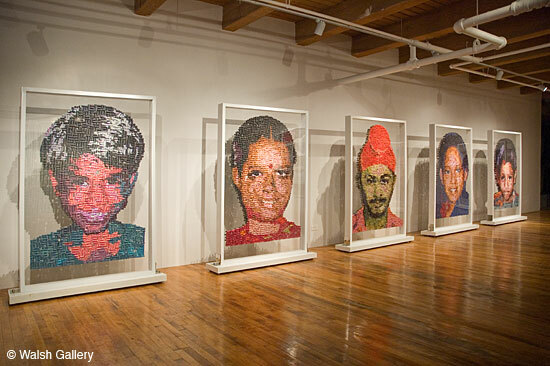 Synonym is a series of seven oversized portraits made up of painted rubber stamps—each one bearing the name of a missing person in India. The beauty and awe evoked by the distant viewing of each portrait (mostly of young, smiling children) gradually diminish as viewers get closer. The clarity of the subject matter is consequentially compromised with each step, and the portraits morph into heartbreaking memorials of loss. It is impossible to remain unfazed by such a gently devastating body of work. 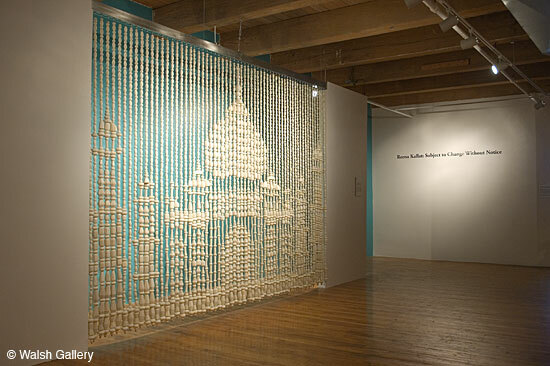 Reena Kallat’s work is showing at Walsh Gallery through October 11, 2008. Her work is collected internationally and can be found anywhere from the Shanghai Zendai Museum of Modern Art to Chicago’s very own Cultural Center. 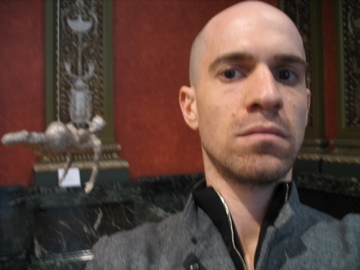 To learn more about Shlomi’s musings on this, that or art click here. With James’s sister giving birth to twin girls (whose Jewish names I am still working out in my head, I have narrowed it down to Bluma, Goola, Stuma, and Henga—all stunning), I realize that there are so many misconceptions about babies. By and large, they are viewed as buttery lumps of stupid coated in cuteness. Actually that part is true—BUT!—a common misconception about babies is that their first word is “mama.” That’s just an ugly, pleated lie. And it’s not “papa” or “dada” or “caca” either. Actually, it is “oh, girl”, combined with a perfect 360-degree eye roll. At least that’s the way it works with me and any other creature who has blossomed into becoming a gorgeously beautiful man. (And if you do know one, send him my way, I take phone calls day and night, just please, no mail order grooms.) So yeah.